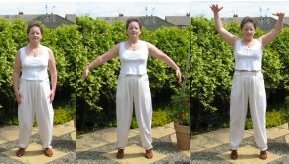 This is one of a set of excellent qigong exercises designed to strengthen the back and promote a general sense of well being. Imagine that you are a powerful eagle as you raise your body and heels and stretch your wings out to get ready for flight - great fun. 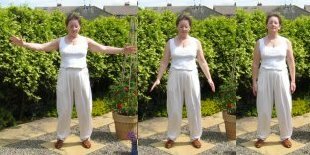 and lastly, if you wear supple shoes, the action of raising up and on the ball of the foot massages the 'bubbling well' - the acupressure point on the ball of the foot.